How must California grocers comply? 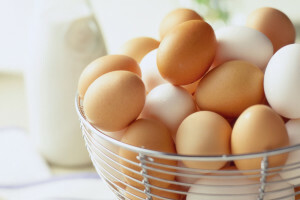 Cartons of eggs at stores in the Golden state must now be marked “California Shell Egg Food Safety Compliant” – distinguishing that they meet new regulatory standards passed by California voters back in 2008. Despite the law’s passage nearly six years ago, the law didn’t go into effect until January 1st of this year. Specifically the law requires that henhouses feature enough space where chickens are able to move around with a sizeable amount of space that allows them to spread their wings. It’s intended to look out for animal welfare but transitioning to it is proving costly on both sides – requiring both poultry producers and the grocers who buy from them to spend more in the meantime. As it stands currently, standard henhouses feature cages limited in size where multiple hens are packed into small living quarters. But some contend that providing hens with expanded space could simply result in more injuries for the chickens. Are any companies okay with the change? Yes, but they’re mostly big names. Some companies in the services industry, including Whole Foods, Starbucks and Burger King, have voluntarily agreed to comply with the law, not just in California but outside the state as well. How is the poultry industry adapting and where are the increased costs coming from? Poultry producers nationally have had two options when complying with Proposition 2: Either construct new cages or reduce the amount of chickens they keep in each – requiring new manufacturing costs or forcing them to cut down on poultry production due to having less chickens. Meanwhile, poultry producers have raised pricing on those eggs to help cover the transition – hurting grocers in the process and the American shoppers who buy them (grocers are raising egg prices as well). While it’s expected that the industry will eventually meet the new demands and stabilize financially after some time, it’s quite possible that egg prices in California will remain high for the foreseeable future. Ultimately those who could hurt most from the law are consumers. Egg prices at stores in California have experienced no less than a 35% increase, Ronald Fong of the California Grocers Association recently stated, according to NPR.